Over the last few weeks, we have reflected on the seven times Jesus tells us, “I am . . .” We have looked to his words for wisdom; we have looked at his actions for guidance. Jesus’ statements also reflect the “I am who I am” statement and the sacred Tetragrammaton of four Hebrew consonants YHWH. Judeo-Christian tradition teaches us the importance of this name and today we consider just what this great I AM might mean to us. From Richard Rohr, OFM: I cannot emphasize enough the importance of the Jewish revelation of the name of God. As we Christians spell and pronounce it, the word is Yahweh. In Hebrew, it is the sacred Tetragrammaton YHVH (yod, he, vay, and he). I am told that those are the only consonants in the Hebrew alphabet that are not articulated with lips and tongue. Rather, they are breathed, with the tongue relaxed and lips apart. YHVH was considered a literally unspeakable word for Jews, and any attempt to know what they were talking about was “in vain.” As the commandment said: “Do not utter the name of God in vain” (Exodus 20:7). All attempts to fully think God are in vain. From God’s side, the divine identity was kept mysterious and unavailable to the mind. When Moses asked for the divinity’s name, he received only the phrase that translates “I AM WHO I AM” (Exodus 3:14) . . . When considered in this way, God is suddenly as available and accessible as the very thing we all do constantly—breathe. Exactly as some teachers of prayer say, “Stay with the breath, attend to your breath”—the same breath that was breathed into Adam’s nostrils by this Yahweh (Genesis 2:7); the very breath “spirit” that Jesus handed over with trust on the cross (John 19:30) and then breathed on us as shalom, forgiveness, and the Holy Spirit all at once (John 20:21-23). And isn’t it wonderful that breath, wind, spirit, and air are precisely nothing—and yet everything? God the creator comes to us each morning as we rise to remind us that we are created in God’s image out of love, to be used in and for love. Christ the redeemer leads us each day to guide us with his example of hope and compassion. The Holy Spirit abides with us faithfully each evening, resting upon our open hearts to heal us as evening closes in. As we consider what God means with this great promise of I AM Who I AM, we put ourselves in the hands of the one who created us, the one who heals us, the one who loves us beyond all that is comprehensible. Rohr, Richard. “The Gate of Heaven is Everywhere.” Center for Action and Contemplation, 6 Oct. 2014, cac.org/. We have spent time with this prophet for much of the week and we have allowed ourselves to be open to a flood of emotions. When we consider the story of Hosea and Gomer we experience the depth and breadth of God’s patience, fidelity and love. 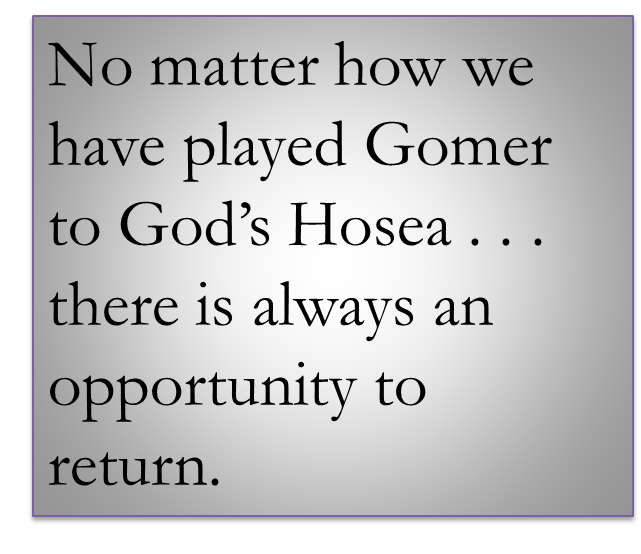 On this third Sunday in Lent we are invited to be frank about when and how we play Gomer to God’s Hosea. We are also invited to consider the depth and breadth of Christ’s sacrifice; we are called to sink into the profundity and intensity of the Spirit’s consolation. With God there is always an opportunity to return. Israel becomes the harlot when she wanders from the covenant she had entered into with Yahweh. She oppresses the poor and adores idols; the mechanical offering of holocausts by her priests has become a false worship. Israel’s prophets warn her of the consequences of her infidelity but she continues to ignore these admonitions. She leaves behind the gift of Exodus when Yahweh brought her out of captivity to a world of freedom. She scoffs at the notion that a future exile will again enslave her. And the longer she remains away from Yahweh, the more difficult – and useless – she sees the road of return. And in her headlong desire to do precisely as she likes, she sends herself into her own loveless and dreadful exile. If only she might return . . . While Israel flirts with cataclysm and ignores all signs of warning, Yahweh abides and calls. Yahweh hopes and prepares. Yahweh waits and loves. While Gomer gives herself to any who would have her in order to feel the quick rush of easy pleasure, Hosea abides and calls. Hosea hopes and prepares. Hosea waits and loves. Hosea sees this parallel and so must we. And while Hosea aches for his lost love and yearns for Israel to return to her true role as Yahweh’s spouse, Yahweh waits for Israel to return. And so does God call and wait on us today. Good and patient God, we see ourselves in Gomer when we forget to visit with you each day. Renew in us a desire to be faithful to you. Good and constant God, we see ourselves in Gomer when we are easily lured away from you. Renew in us a willingness to put aside the quick charms of a self-centered life. Good and tender God, we see ourselves in Gomer when we refuse to see the depths of your love. Renew in us our understanding of your mercy, a willingness to persist through our doubt, and an eagerness to put everything aside for you. Good and ever-present God, we see ourselves in Gomer when we fail to return to you. Renew our strength, renew our courage, renew our faith, renew our hope, renew our love, and renew our all . . . so that we might return to you. While they are looking on . . .
Saturday, February 16, 2013 – Ezekiel 12 – While they are looking on . . . In today’s Noontime we are reminded that we do not have to fight against the obstacles in life’s journey that loom so large. It tells us that when barriers to freedom are gigantic and overwhelming we cannot struggle against them. It says to us that we must turn to God in trust and obedience. We must do as Jesus does even while the naysayers are looking on. Going into exile was an embarrassment to the “chosen” people. They who had always been miraculously protected by Yahweh now found themselves going into captivity at the hands of the very pagans whom they had previously conquered in battle. The Israelites have discovered that while they fought against the barbarian outside of the city walls, it was the enemy within that doomed them. Corruption and deceit in their own community had decayed their society to the foundation. There is no other outcome to expect than the one they are living . . . they are to pack their baggage in full view of the enemy, and then they are to dig their way through the broken walls of the city to march into captivity. And all of this while the unbelievers are looking on. So many times we find ourselves living among rebellious people, and we sometimes cannot even tell if we have become one with the idol worshipers. We feel as though the world has gone mad and we are one of the few sane ones who remain. In our Noontime journey we have reflected on how to weather the whirlwind when we see and hear it approaching; today we reflect on how to journey faithfully into captivity . . . while the world is looking on. There is a remnant left by Yahweh: Yet I will leave a few of them to escape the sword, famine and pestilence so that they may tell of all their abominations among the nations to which they will come; thus they shall know that I am the Lord. This just yet merciful God is always willing, and indeed eager to give his people another door to salvation, another opportunity to return. God will vindicate us even in the darkest and most painful of times even while those who deny us are looking on. There are occasions when it seems as though we alone are able to see what others cannot. Circumstances and events speak loudly to us while they only whisper to those around us or speak not at all. The prophecy we hear and see and then repeat for others falls on stubborn ears. The world mocks those who live simply so that others may live. Society denies truth so that deception might reign. Many favor the apparent security of tangible comfort while few remain faithful to the Spirit who is willing to abide while those who wish us gone are looking on. Ezekiel describes a vision today that seems a long way off and yet is present in the Spirit within. Ezekiel says that in a distant time to come there shall no longer be any false visions or deceitful divinations and yet this word is fulfilled by Christ in us today. Ezekiel tells us of a future in which none of God’s words will be delayed any longer and yet this future lives in us today because God loves us so . . . even while the naysayers are looking on. Let us spend time with this prophecy today. And let us see that, despite the naysayers, Ezekiel’s vision lives in us in this present moment through the promise, the rescue and the love of God. To read more about weathering the storms on our journey, type the word whirlwind into the search box on this blog. The opening paragraphs of today’s Noontime were written on August 12, 2010. Today’s post is an amplification of that reflection. The seeming conflict between human weakness and divine power is one we humans constantly explore; we can never quite understand the inversion of logic that Jesus brings to the world much less put this inversion of thought into action ourselves. When we experience dreadful times we must turn to the truth that we are made whole in our emptiness, that sorrow always carries with it joy, and that God resides with those who are broken and forgotten. In our deepest grief transformation lies in the outrageous hope God offers us . . . in this hope beyond hope that the incredible promise of Christmas is indeed true. The Book of Lamentations may seem like as unusual point of reflection as we enter fully enter the Christmastide but we find something here today that speaks to our human circumstance. We discover that grief is always a subtle presence at any celebration . . . and that restoration accompanies all loss when we remain in the Spirit. The five laments found in this book of the Bible “combine confession of sin, grief over the suffering and humiliation of Zion, submission to merited chastisement, and strong faith in the constancy of Yahweh’s love and power to restore. The union of poignant grief and unquenchable hope reflects the constant prophetic vision of the weakness of man and the strength of God’s love; it also shows how Israel’s faith in Yahweh could survive the shattering experience of national ruin”. (Senior 1017) The inversion the Christ Child brings to the world is the same conversion of the Old Testament Yahweh. A few weeks ago we studied Psalm 90 and reflected on its truth. In this sacred poem we find our human limitations compared with God’s infinite goodness; we are told that God transforms even our most crushing suffering when we hand over our pain. It remains for us to act on this knowledge. It is for us to see the connection between the deep heartache of human distress and the nativity of inestimable hope in the person of Jesus. Why reflect on a centuries-old lament when we celebrate happiness? Because Christ represents the only true passage from the inconsolable grief we experience to the indescribable joy we say we seek. And so we might spend a bit of time today reflecting. Do we really want to be happy or do we sabotage our chance to know true delight? Each of us must make this journey to uncover our hidden plots against ourselves and others. Do we honestly want to experience true gladness or do we dwell in the lamentation of our lives refusing to step into the joy fearing that the promise of Christ is yet another disappointment? Each of us must be willing to hand ourselves over to God and to give a full and candid accounting of our days. Do we truly believe in the conversion of poignant grief through the transforming power of unquenchable hope? If so, and if we honestly wish to live in true Christmas joy promised by the Christ Child, we must plumb our own depths of lamentation and ask: What do we prefer, a life of frustration and illusion or a life filled with promise, trust, and joy? It is for each of us to pause today. What is the true message of the Christ Child? It is for each of us to decide today. Do we believe in the message of Jesus’ Nativity? It is for each of us to act today. Are we prepared to carry God’s unquenchable Christmas hope into the world for the conversion of our most poignant grief? As we read this chapter of Ezekiel we might be lured into what Richard Rohr – and many others – calls dualistic thinking. Decisions are made in a yes/no, black/white, off/on world. If we are able to step outside of our small perspective and move into a greater view of the world we understand that this kind of reasoning is dangerous in that it limits our vision . . . and therefore limits us. Rohr examines how life is a paradox in his blog posts at http://richardrohr.wordpress.com They are worth visiting as are his CD lectures, the webcasts and other resources on his Rohr Institute site at http://www.cac.org/ as we reflect on the way we think, the way we respond to conflict, and the way we seek resolutions to the difficult passages in our lives. The portion of Ezekiel that we read today may be used as fuel for the fire of prejudice . . . if we allow the voice of revenge and conquest to go unchecked. As the recent events in our global community unfold, we are reminded that fanaticism can never be good. As my siblings and I grew, my Dad intoned to us regularly: Anything is a bad thing when taken to extremes . . . even a good thing. He understood that words like the ones we read today can be taken out of context, can be blown out of context and morphed in importance. Any single verse, Dad would say, when taken in isolation does not tell the whole story. Read the story. When my father and grandfather told us to read the whole story what they meant was this: stop, think, pray, listen, think, read, think, pray, share ideas, pray, think, pray . . . and act. We want to take this method with us as we plunge into Ezekiel’s words against the nations. To what does he call us? The Old Testament Yahweh can be seen here as a god of vengeance and when we read these verses with anger in our hearts we might believe that God himself justifies the revenge we feel against those who have injured us; but we are also reminded that Yahweh’s love for creation knows no bounds. The Old Testament Yahweh can be seen here as a god who exacts precise payment for wrongs committed; but we know that Yahweh’s generosity and compassion cannot be outdone when we remember his care for the enslaved and powerless. The New Testament Jesus fulfills the promise of reunion and union first uttered by Yahweh. The New Testament Jesus brings human hands and feet and voice to the mercy and compassion first shown by Yahweh. When we find ourselves in turmoil and wishing to take revenge against the people who have injured us we must not let dualistic thinking close off possibilities of healing, reconciliation and union. When we find ourselves in deep sorrow over a loss we have suffered we must not let simplistic rule-following to replace decision-making by a well-formed conscience. When we feel ourselves being pulled into the vortex of darkness that would have us chant slogans that condemn, that would lead us to take an eye for an eye, that would ask us to rail against the nations . . . we must first stop to think and to pray, and to seek so that we might find . . . the forgiving, open, healing way of Christ. For it is Christ who embodies all that is good. It is Christ who brings us the outrageous hope that even the most dire circumstances may be righted. It is Christ who will help us to build bridges to the nations. The name “Mostar” means “the city of bridges”. To read more about what happened to the bridges in Bosnia during the most recent Balkan wars, click on the image above or go to: http://balkansnet.org/mostar.html Follow more links on that page to read and reflect on reconciliation and revenge.